Pitchcare were delighted to be part of a 'Planting Party' today at Edgbaston Priory Tennis Centre. The Club work closely with the Heart of Birmingham Vocational College (HBVC), which is a full time educational provision for young people with special educational needs such as Autism Spectrum Disorder and Downs Syndrome. Late last year they completed an application, in partnership with HBVC, with the Woodland Trust for a tree planting pack of 420 saplings. The application was successful and today saw the staff begin to plant the saplings on the border between the tennis club and the adjoining Priory School. 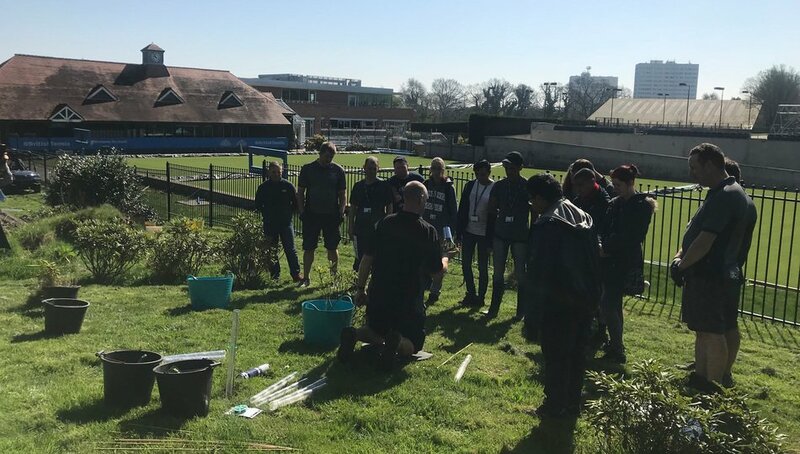 The weather was on side as the Priory staff, led by Grounds Manager David Lawrence, and a group of students started the planting scheme with a very brief introduction on how to properly plant and then look after the saplings. The idea being that the students from HBVC will learn some useful gardening skills, whilst also planting a sizeable woodland area. Materials were provided as part of the tree planting pack supplied by the Woodland Trust and machinery and tools used from the Club. Assistant Grounds Manager, John Lawrence commented: "This is such a fantastic project and provides an opportunity for the students to really prove what they are capable of doing. We have a group of students on site every week and they really improve productivity and are such a help to the team. One of the students has been so good that we are offering him an internship, when College starts again in September, which will mean he's on site two days per week learning new skills and I'm sure he'll become a valued part of the team." If you are in or surrounding the Birmingham area, and you feel you would be able to offer an opportunity to one of the students, please contact Ranjit Garcha, Employability Co-ordinator on 0121 359 1714.